Can science explain blue skin of Lord Krishna? The world has depicted Lord Krishna as a baby stealing butter and a charming youth holding a flute, with a peacock feather on his head. And in all these depictions, there’s one common link: the blue colour of his skin. The question as to why his skin looked different from ours must have nudged you? The legends tell us that Lord Krishna had drunk poisoned milk given by a demon when he was a baby and that had caused the bluish tinge in his skin. Etymologically speaking, the Sanskrit word ‘Krishna’ means black or dark. At times, it is also translated as “all attractive”. According to Vedas, Lord Krishna is a dark-skinned Dravidian god. 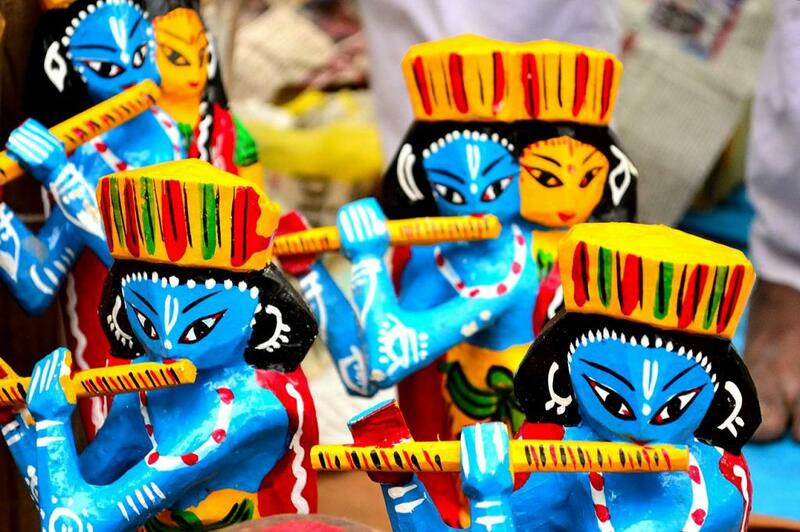 Even in traditional patta chitras (cloth art) in Odisha, Lord Krishna and Vishnu are always shown having black skin. Then why is Lord Krishna universally depicted as someone with blue skin? Hindu religion believes in symbolisms and the blue color is a symbol of the infinite and the immeasurable. According to Swami Chinmayananda, the inspiration behind Chinmaya Mission, whatever is immeasurable can appear to the mortal eye only as blue, just like the cloudless summer sky appears blue to the physical eye. Since Lord Krishna is beyond our perception, it seemed apt to attribute this colour to him. Some are of the opinion that the bluish tinge in Lord Krishna’s skin is not the colour of the material body but the eternal spiritual body of the Lord that emits blue aura. According to Bhagavad Gita, the blissful form of Lord Krishna is visible only to pure devotees. He may have bewildered the non-devotees, but those who offered pure devotional service to Him had always seen Him in his blue blissful form. But in real life, can people actually have that skin colour? While James Cameron, in his film Avatar, showed Na’vi having blue skin to imply otherness, there’s nothing alien about being born with a blue skin. Blue-tinged skin is the result of methemoglobinemia—a condition wherein hemoglobin, the molecule in red blood cells that distribute oxygen to the body, is unable to release oxygen effectively to body tissues. As the blood doesn’t get oxygenated, it makes the skin look blue, lips purple, and blood chocolate-coloured. Most of us have less than 1 per cent of methemoglobin. The skin gets the bluish tinge when that level rises to 10-20 per cent. Six generations of the Fugate family, who lived in the hills of Kentucky from 1800 to 1960, had blue skin. The blue lineage began in the early 1800s when Martin Fugate, a French orphan, settled on the banks of the Troublesome Creek. He married a red-haired American lady who had a very pale complexion. Their genetic chemistry resulted in a mutation and the both unknowingly carried the recessive gene that resulted in their descendants being born with blue skin. Due to intermarriage, the next generations were also born with this rare disorder. However, most of the family members lived into their 80s and 90s with no significant health problems. Methemoglobinemia may be passed down through families or can be caused by exposure to certain drugs and chemicals. Uranium toxicity because of contaminated water is also believed to have the potential to cause ‘blue baby syndrome’. Indiscriminate use of chemical fertilizers in Punjab villages saw a surge in blue baby syndrome in 2009. Cases of blue baby syndrome were reported in villages in Romania and Bulgaria that faced sanitation problem and high level of nitrates in groundwater. Hopefully, Lord Krishna wasn’t a victim of groundwater contamination.